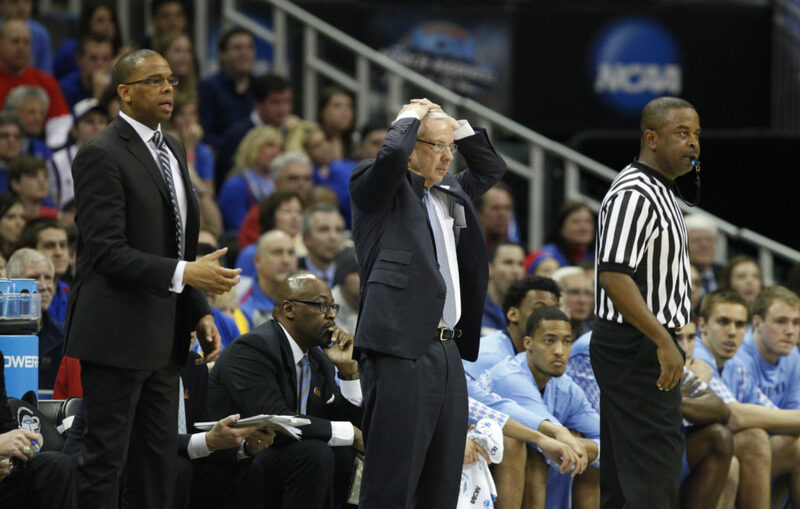 North Carolina head coach Roy Williams, center, puts his hands on his head during after a missed bucket by the Tar Heels in the second half, Sunday, March 24, 2013 at the Sprint Center in Kansas City, Mo. Kansas City, Mo. ? For the first time in his three match-ups with his former school, North Carolina coach Roy Williams watched his team be the more physical team during Sunday’s third-round showdown at Sprint Center. 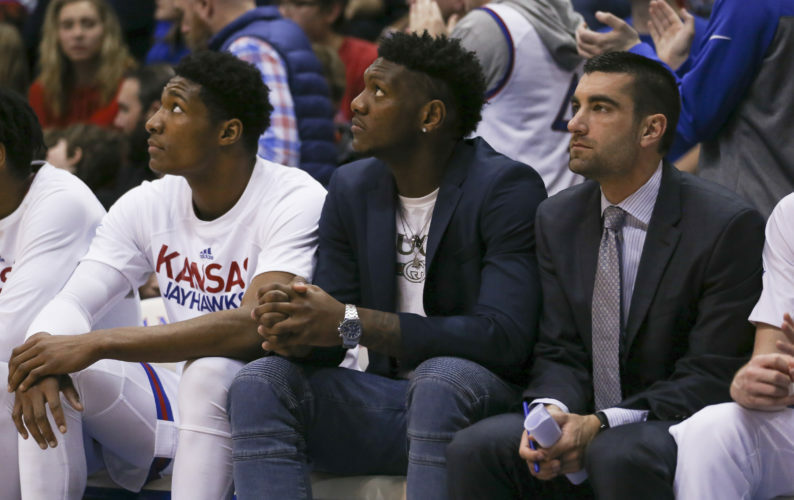 By game’s end, however, the scene was the same as it had been after the first two meetings in 2008 and 2012 — an emotional Williams sitting at the podium congratulating Kansas and talking about the disappointment of another season finished. After the game, North Carolina’s players, who have come to love Williams like a father, saw their coach’s 0-3 record against KU two ways. For 20 minutes Sunday, it looked as if Williams might finally break his personal losing streak to the Jayhawks. North Carolina (25-11) raced out to a 12-2 lead, was by far the more aggressive team and led 30-19 late in the half before taking a 30-21 lead into the locker room at the break. 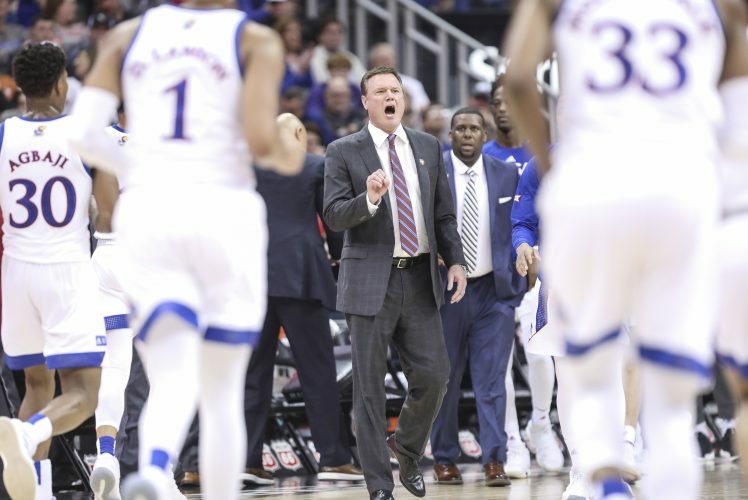 That all changed quickly, though, when the teams returned to the floor for the second half, as Kansas started the final 20 minutes with a 16-3 run and led by 12, 50-38, with less than 10 minutes into the final frame. With every KU bucket, the pro-Kansas Sprint Center crowd grew louder, fueling the Jayhawks’ 49-28 second-half onslaught. “Yeah, it felt like we were playing at Kansas,” UNC junior Reggie Bullock said. Both teams shot terribly in the first half, with Kansas making just seven of 28 shots (25 percent) and UNC hitting just 11 of 42 (26.2 percent). 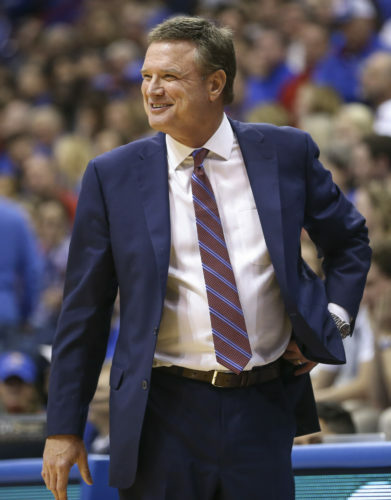 But the Jayhawks (31-5) caught fire in the second half, shooting 63 percent (17-of-27) to finish at 44 percent for the game. UNC remained ice cold, finishing just 22-of-73 (30 percent) for the night. For the umpteenth time this season, KU center Jeff Withey played a huge role forcing KU’s opponent to shoot such a poor percentage. In addition to his 16 points and 16 rebounds, Withey blocked five shots and altered countless others. “When I got into the lane, I was worried about the shot-blocker too much,” Bullock admitted after the game. 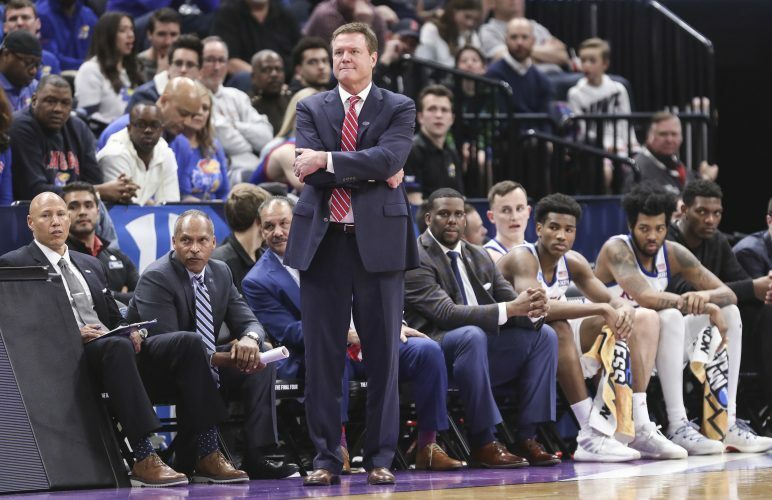 The victory moved the Jayhawks into the Sweet 16 for the third consecutive season and, for the second year in a row, sent Williams home with a heavy heart.